Happy Spring Equinox!! It has been a long, cold, snowy winter. Today we will see 12 hours of daylight, as well as a beautiful full moon. Let’s celebrate by highlighting a few of the many reasons to love springtime in Boulder. Boulder will be blooming… literally. 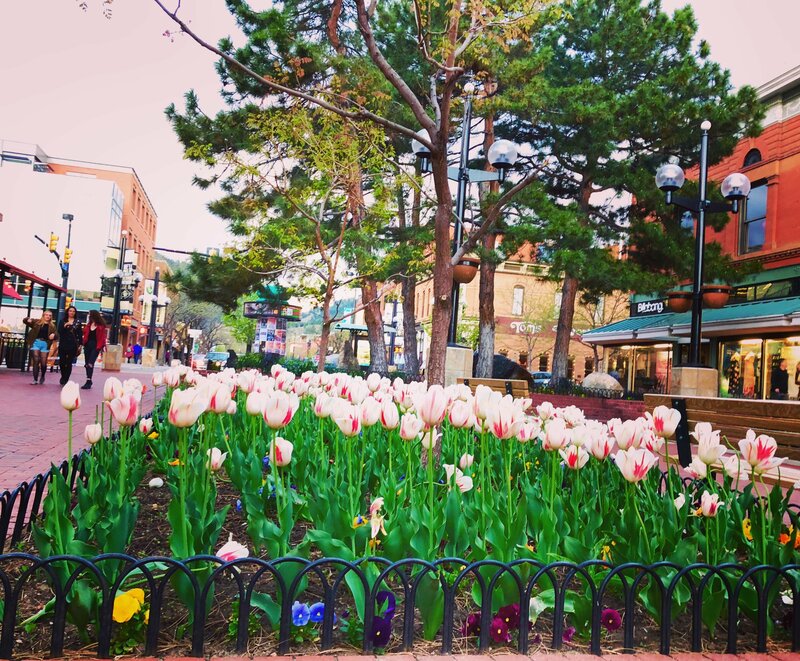 In the heart of the city, 15,000 tulips blossom in the early weeks of spring on the Pearl Street Mall. Outside of the city, wildflowers will emerge in green spaces and along hiking trails. Our sometimes misunderstood friends, the sunny dandelion, will prosper (as long as you give them a chance! ), giving life-sustaining nutrition in the early days of spring to our native pollinators. Keep your eyes to the ground — any time now you’ll spot those first sprouts of green. Not long after, the rolling hills and valleys will burst into the brightest green, made brighter every time a spring snowstorm melts away. It is a beautiful thing to witness. Boulder has so many events in the Spring, they really deserve their own post, but I will delve into some of my favorites. Boulder Arts Week puts the spotlight on local artists with a week-long festival featuring workshops, performances, art walks, exhibitions and more. A favorite downtown Boulder tradition, the Tulip Fairy and Elf Festival invites kids of all ages to revel in the magic of springtime. The Boulder Farmer’s Market re-opens in April, bringing fresh flowers, local produce, live music and amazing food every Saturday. Boulder closes out spring with the fabulous Boulder Creek Fest and the BolderBoulder over Memorial Day weekend. Coloradans don’t need the temperature to climb much higher than 50 degrees before they are trading in snow boots and puffy coats for flip flops and shorts. Sure, we’ll need them now and then, but in the meantime it’s time to soak in the Vitamin D. By April, average highs are around 63 degrees. Coupled with the blazing sun at this elevation, April days are perfection. With the sunshine and warmth come lots of opportunities for outdoor fun! Hikers can put away their microspikes as ice melts off the trails. Tourism tends to hold off until summer, allowing locals to enjoy the trails and mountain parks before the busy season. Kids flock to Boulder’s 60+ urban parks while parents breathe a sign of relief. Spring showers bring breathtaking rainbows, adding to the colorful brilliance of the season. A welcome sight after a cold, long winter.